Sen. John McCain (R-AZ) is a leading advocate in the U.S. Senate for aggressive U.S. foreign policies, including an interventionist “war on terror.” A founding member of the neoconservative-led Committee for the Liberation of Iraq, McCain consistently backed the George W. Bush administration’s efforts to expand the “war on terror” in the Middle East, championing the Iraq War and the invasion of Afghanistan. More recently, he has been a leading congressional advocate for confrontational policies on Iran and intervening militarily in Syria’s civil war. McCain is chairman of the powerful Senate Armed Services Committee, a post he attained after the GOP won a majority in the Senate in the 2014 midterm elections. McCain’s stature as one of his party’s leading hawks has been buttressed in part by his longtime chairmanship of the International Republican Institute, the GOP-linked arm of the National Endowment for Democracy that has been closely associated with subversive U.S. actions in Latin America and other parts of the world. McCain has been a leading advocate of U.S. intervention in Syria’s civil war, characterizing the Obama administration’s reluctance to involve itself in the conflict as “shameful” and “feckless.” An early proponent of funneling arms to opposition forces, McCain—along with Graham and Lieberman—penned an op-ed for the Washington Post in August 2012 claiming that “U.S. reluctance to intervene in Syria” was “allowing this conflict to be longer and bloodier, a radicalizing dynamic.” Earlier that year, McCain and Graham paid a surprise visit to Free Syrian Army forces in Turkey, declaring in a statement that “Diplomacy with Assad has failed,” even as former UN Secretary General Kofi Annan was attempting to negotiate a ceasefire. In September 2013, after new reports emerged alleging the Syrian government had used chemical weapons, McCain led calls in the Senate for the United States to launch military strikes against Syria. He strongly denounced the Obama administration for ultimately deciding not to attack and instead agreeing to a Russian-brokered deal on Syria giving up its chemical weapons stockpiles. “What concerns us most is that our friends and enemies will take the same lessons from this agreement: They see it as an act of provocative weakness on America’s part,” McCain said in a joint statement with Graham at the time. In October 2014, McCain told CNN that ISIS was prevailing in the fight in Iraq. “They’re winning, and we’re not. The Iraqis are not winning. The Peshmerga, the Kurds are not winning,” he opined. He also argued that the United States should “take the fight to Syria’s president” as part of war against ISIS, and called for establishing a no-fly zone in Syria. McCain has advocated an aggressive U.S. posture towards Russia in response to the on-going Ukraine crisis. He has called for adopting “crushing” sanctions against Russia and has said that “it is long past time” to arm Ukraine. In March 2014, McCain lamented that there was not a military solution the United States could pursue in Ukraine. “I’d love to tell you that there is Andrea, but frankly I do not see it. I wish that there were. … I do not see a military option and it’s tragic,” he told MSNBC’s Andrea Mitchell. In May 2015, Ukrainian President Petro Poroshenko appointed McCain as an advisor. McCain was also an early advocate of President Bush’s “surge” in Iraq, a marked escalation of the war that came shortly after a sweeping GOP defeat in the 2006 midterm elections, which were widely interpreted as a public rebuke of the deeply unpopular conflict. After returning from a January 2007 trip to Afghanistan, Iraq, and Israel with Sen. Joe Lieberman (I-CT), McCain and Lieberman presented their opinions on Iraq to an audience at the American Enterprise Institute (AEI), the Washington, D.C.-based think tank that serves as home for many leading neoconservative writers. Emphasizing his belief that the Iraq War was still “winnable,” McCain laid out his argument for a troop surge: “The presence of additional coalition forces would give the Iraqi government the ability to do what it cannot accomplish today on its own—impose its rule throughout the country. In bringing security to Iraq and chiefly to Baghdad, our forces would give the government a fighting chance to pursue reconciliation.” This plan was echoed by one proposed by AEI scholar Frederick Kagan and retired Gen. Jack Keane, which unveiled at the same AEI event at which McCain and Lieberman spoke. Earlier, in 2002, McCain played a role in supporting aWhite House-orchestrated campaign to build public and congressional support for the invasion of Iraq when he served as an honorary co-chair of the Committee for the Liberation of Iraq, founded in late 2002 by Bruce Jackson of the now-defunct Project for the New American Century. While most of the committee members were neoconservatives and Republican Party hawks like McCain, several hardline Democrats also supported the group, including Lieberman and former Sen. Bob Kerrey (D-NE). The group’s executive director was Randy Scheunemann, a lobbyist who while on the staff of then-Senate Majority Leader Trent Lott (R-MS), wrote the Iraq Liberation Act, which authorized $98 million for the Iraqi National Congress and served as a key stepping-stone on the path to the Iraq War. Scheuenmann went on to become McCain’s top foreign policy advisor during the 2008 presidential race. Outside observers noted the impact of Scheunemann and other hawks on McCain’s policy preferences. According to John Judis, it was during McCain’s failed bid for the GOP 2000 presidential nomination that the influence of hardliners began to take root. Judis writes that McCain began “seeking to differentiate his views from those of other Republican presidential aspirants and from the growing isolationism of House Republicans … [placing] his new interventionist instincts within a larger ideological framework. That ideological framework was neoconservatism. McCain began reading theWeekly Standard and conferring with its editors, particularly Bill Kristol.” Shortly after his staff consulted with Kristol, McCain hired a bevy of neoconservative-aligned operatives, including Scheunemann, Marshall Wittmann , and Daniel McKivergan . The impact of this group of advisors on the senator’s thinking was revealed in early 1999, according to Judis, when McCain spoke at Kansas State University using a speech Scheunemann helped draft. In it, McCain echoed the neoconservative idea of “national greatness conservatism,” arguing: “The United States is the indispensable nation because we have proven to be the greatest force for good in human history…. [W]e have every intention of continuing to use our primacy in world affairs for humanity’s benefit.” Judis reported about the stumping, “The centerpiece of the speech was a strategy that McCain called ‘rogue-state rollback,'” a term Scheunemann claimed to have coined based on rhetoric used by critics of 1950s Cold War containment strategy. McCain has served since 1992 as the chairman of the International Republican Institute, a program of the Republican Party that was created in 1983 as a channel for funding from the then-newly created National Endowment for Democracy . Since its early years of work supporting U.S. partners in Central America and the Caribbean, the IRI has gained a reputation as a surrogate for interventionist U.S. foreign policy. IRI has offices around the world, and currently funds nongovernmental organizations in 50 countries. During the Bush administration, the IRI was a leading U.S. actor in supporting individuals and organizations that sought to overthrow President Jean-Bertrand Aristide in Haiti (successfully in February 2004) and President Hugo Chavez in Venezuela (unsuccessfully in April 2002). Jennifer Steinhauer, “With Chairmanship, McCain Seizes Chance to Reshape Pentagon Agenda,” The New York Times, June 8, 2015,http://www.nytimes.com/2015/06/09/us/politics/mccain-uses-committee-post-to-press-for-defense-agenda.html. New York Times, November 26, 2012, http://www.nytimes.com/2012/11/27/us/politics/liebermans-retirement-is-end-of-three-amigos.html?pagewanted=all&_r=0. Jose DelReal, “John McCain in New Hampshire: ‘Lindsey Graham, he’s my man!,’” The Washington Post, August 1, 2015,http://www.washingtonpost.com/news/post-politics/wp/2015/08/01/john-mccain-in-new-hampshire-lindsey-graham-hes-my-man/. Sydney Abeyta, “Sen. John McCain Talks Iran, ISIS at Tempe Forum,” AZ Central, September 4, 2015,http://www.azcentral.com/story/news/arizona/politics/2015/09/04/john-mccain-iran-isis/71713906/. Jamie Jackson, “John McCain Denounces Iran Deal, Says ‘We’re Losing Badly’ to ISIS,” The Daily Signal, July 15, 2015,http://dailysignal.com/2015/07/15/mccain-denounces-iran-deal-says-were-losing-badly-to-isis/. Morgan Chalfant, “John McCain: ‘Delusional and Dangerous’ Iran Nuclear Deal Built on ‘Hope,’” Free Beacon, July 14, 2015,http://freebeacon.com/national-security/john-mccain-delusional-and-dangerous-iran-nuclear-deal-built-on-hope/. Newsmax, “Sens. McCain, Johnson Express Regret Over Iran Letter,” March 13, 2015, http://www.newsmax.com/Newsfront/mccain-Johnson-regret-Iran/2015/03/13/id/630020/. Jon Rainwater, “McCain Joins Bolton, Invites Israel to Bomb Iran,” The Huffington Post, March 31, 2015, http://www.huffingtonpost.com/jon-rainwater/mccain-joins-bolton-invit_b_6973978.html. [9Zaid Jilani, “McCain Suggests Israel ‘Go Rogue,’ Blow Up Iran Negotiations By Starting War,” Alternet, March 29, 2015, http://www.alternet.org/mccain-suggests-israel-go-rogue-blow-iran-negotiations-starting-war. 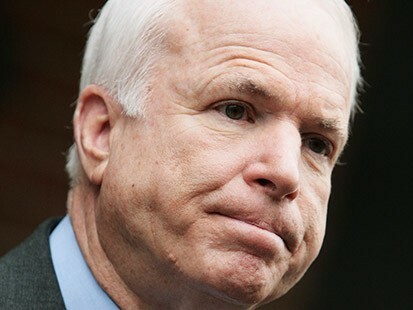 Kevin Robillard, “John McCain: Obama ‘shameful’ on Syria,” Politico, July 23, 2012, http://www.politico.com/news/stories/0712/78851.html. John McCain, Joseph I. Lieberman and Lindsey O. Graham, “The risks of inaction in Syria,” Washington Post, August 5, 2012,http://www.washingtonpost.com/opinions/mccain-lieberman-and-graham-the-risks-of-inaction-in-syria/2012/08/05/4a63585c-dd91-11e1-8e43-4a3c4375504a_story.html. Josh Rogin, “McCain and Lieberman meet with the Free Syria Army,” Foreign Policy “The Cable” blog, April 10, 2012,http://thecable.foreignpolicy.com/posts/2012/04/10/mccain_and_lieberman_meet_with_the_free_syria_army. Wayne White, “Syria: Pressure for US Military Action Rising Ominously,” LobeLog, May 6, 2013, http://www.lobelog.com/syria-pressure-for-us-military-action-rising-ominously/; Reuters, “McCain: Israeli strikes could force US action, Jerusalem Post,” May 5, 2013, http://www.jpost.com/International/McCain-Israeli-strikes-could-force-Obama-to-act-on-Syria-312153. Wayne White, “Syria: Pressure for US Military Action Rising Ominously,” LobeLog, May 6, 2013, http://www.lobelog.com/syria-pressure-for-us-military-action-rising-ominously/. Darlene Superville, “McCain, Graham blast Syrian chemical weapons deal,” Yahoo News, September 14, 2013, http://news.yahoo.com/mccain-graham-blast-syrian-chemical-weapons-deal-195925431–politics.html. John McCain and Lindsey Graham, “Stop Dithering, Confront ISIS,” The New York Times, August 29, 2015,http://www.nytimes.com/2014/08/30/opinion/john-mccain-and-lindsey-graham-confront-isis.html?_r=0. Rory Carroll, “McCain urges ground troops to defeat Isis: ‘They’re winning, and we’re not,’” Guardian, October 12, 2014,http://www.theguardian.com/world/2014/oct/12/mccain-isis-syria-iraq-strategy. John Bennet, “McCain: More US Boots on Ground in Iraq, Syria,” Defense News, January 26, 2015, http://www.defensenews.com/story/defense/policy-budget/congress/2015/01/26/isis-terrorism-iraq-syria-obama/22349661/. Sandy Fitzgerald, “John McCain: Ground Troops Needed to Stop ISIS, Syria’s Assad,” Newsmax, February 9, 2015,http://www.newsmax.com/Newsfront/John-McCain-ISIS-ground-troops-Bashar-Assad/2015/02/19/id/625698/. Marina Koren, “What Would Vladimir Putin Do if John McCain Gets His Way on Ukraine?,” National Journal, February 19, 2015,http://www.nationaljournal.com/congress/2015/02/19/What-Would-Vladimir-Putin-Do-if-John-McCain-Gets-His-Way-Ukraine. Ben Armbruster, “McCain: ‘It’s Tragic’ There’s No U.S. Military Option In Ukraine,” Think Progress, March 7, 2014,http://thinkprogress.org/world/2014/03/07/3378371/mccain-military-option-ukraine/. AFP, “Ukraine appoints US senator McCain presidential aide,” Yahoo News, May 13, 2015, http://news.yahoo.com/ukraine-appoints-us-senator-mccain-presidential-aide-003503382.html. David Corn, ” McCain in NH: Would Be “Fine” To Keep Troops in Iraq for “A Hundred Years,” Mother Jones, January 3, 2008,http://www.motherjones.com/mojo/2008/01/mccain-nh-would-be-fine-keep-troops-iraq-hundred-years. CNN, “Transcript of Second McCain, Obama Debate,” http://edition.cnn.com/2008/POLITICS/10/07/presidential.debate.transcript/. John McCain, Remarks at the American Enterprise Institute, “Iraq: A Turning Point: Panel II: Reports from Iraq,” January 5, 2007. American Enterprise Institute, “Iraq: A Turning Point: Panel II: Reports from Iraq,” January 5, 2007. John B. Judis, “Minister Without Portfolio,” American Prospect, January 1, 2003. Jim Lobe, “New Champions of the War Cause,” Asia Times, November 6, 2002. John Judis, “Neo-McCain,” New Republic, October 16, 2006. Quoted in “John McCain, Republican,” The Israel Factor, Haaretz.com, November 13, 2006. John B. Judis, “John McCain’s (Disputed) Plan for Middle East Peace,” New Republic, October 25, 2006. Josh Gerstein, ” McCain Signals Distance From Bush, Neocons,” New York Sun, August 23, 2006. Mike McIntire, “Democracy Institute Gives Donors Access to McCain,” New York Times, July 28, 2008; Tom Barry, “Aristide’s Fall: The Undemocratic U.S. Policy in Haiti,” IRC America’s Program, February 27, 2004.